Private, 9th (Service) Battalion, The Royal Fusiliers (City of London Regiment). Army no 75992. He was formerly Army no 54554 with 102nd Training Reserve Battalion. Corporal, 43rd Company, Machine Gun Corps (Infantry). Army no 20016. He was formerly Army no 12458 with the Duke of Cornwall’s Light Infantry. Company Serjeant Major, 12th (County of London) Battalion, London Regiment (The Rangers), 84 Brigade, 28th Division. Army no 2199. He died from his wounds on 24 April 1915. He was 33. Second Lieutenant, 6th (City of London) Battalion, London Regiment (Rifles), 140 Brigade, 47th Division. On that day, 30 men from the Regiment died. I have presumed in the absence of any other information that he was killed in action. Lance Corporal 4th Battalion, Middlesex Regiment. Army no L/14749. He was formerly Army no 13470 with the Royal Fusiliers. 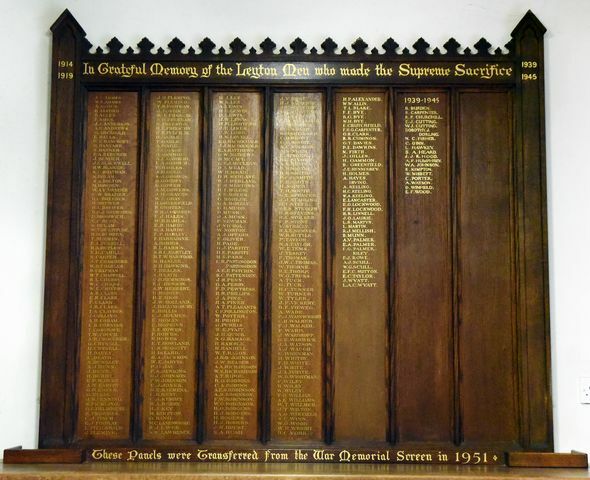 The memorial in St Mary’s states J E but the Army records show J A. 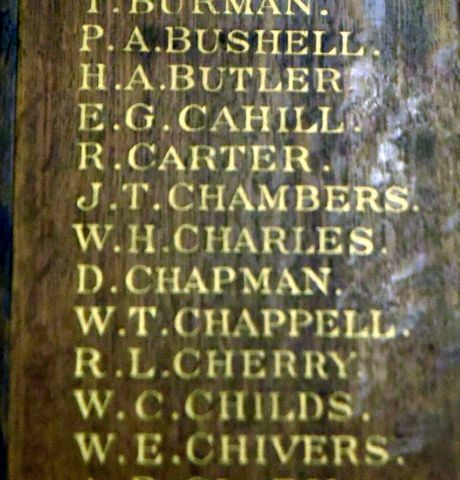 In the Leyton Schools Memorial and Book of Remembrance it states James. And this soldier himself states he was born in Leyton. He was killed in action on 1 July 1916. He was 21. He is remembered in Leyton Schools Memorial and Book of Remembrance, Farmer Road School, Leyton Library. Private, 7th Battalion, London Regiment. Army no 354025 posted to 4th Battalion, The Duke of Cambridge's Own (Middlesex Regiment), 63 Brigade, 37th Division. He was killed in action on 25 September 1915 in the battle of Loos. He was 22. Private, 1st Battalion, The Duke of Cornwall's Light Infantry, 14 Brigade, 5th Division. Army no 10082. He was killed in action on 13 October 1914 in the battle of La Bassee. He was 24. He is remembered on panel 19 of Le Touret Memorial. He was the son of the late William Joshua and Amelia Charles. He was the son of William and Charlotte Childs, 55 Farmer's Road, Leyton. He was killed in action on 1 July 1916 in the battle of Albert. Private, 7th (Service) Battalion, The Duke of Cornwall's Light Infantry, 61 Brigade, 20th Division. Army no 19389. He was killed in action on 4 February 1917 fighting on the Ancre. He was 33. He was killed in action on 4 May 1918. He was 28.